The Granite Gurus: FAQ Friday: Will food coloring stain granite? FAQ Friday: Will food coloring stain granite? "...I have a couple of questions about white stones. I am deciding between Bianco Romano (maybe even honed) and honed Carrara marble. I have read volumes about the maintenance of honed white marble. I am okay with the imperfections. I occasionally make cakes and things which require using gel food coloring. Would one stone be safer than the other? I loved your testing of Tiger Ager and other issues, but I wonder about food coloring... "
Thanks for the email Dolores. I've been asked about food coloring a few times, so I thought I'd post the answer here. It sounds like Dolores is ready and prepared for the ins and outs of marble. As far as food coloring goes....that's the killer. Food coloring and Sharpie markers are the two things I've had major staining issues with over the years. I've seen them stain even the most dense granite colors. Unfortunately, food coloring will most likely stain both the Bianco Romano and the Carrara marble. The good thing is that you can probably get the stain out of either stone if it does happen. There are poultices that will pull out the stain, especially if you catch it right after it happens. 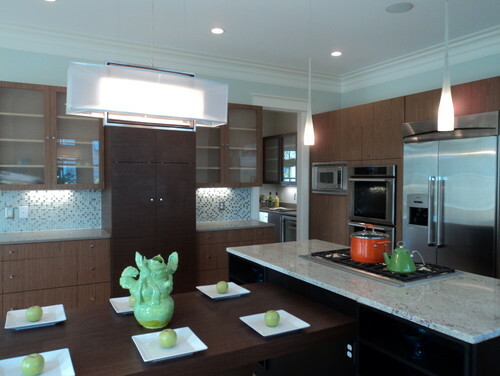 The kitchen below has Bianco Romano on the island and a grey quartz on the perimeter countertops. Do you have a stone question you need answered? Email me and I'll try to help!